Laser Cut Heavy Equipment - Construction Laser Cutting | Laser Cutting Company, Inc. The construction industry provides numerous avenues that can benefit from the use of laser cutting applications to maximize efficiency and production while minimizing wasted time and material resources. Laser Cutting Company brings years of experience and knowledge to the table when it comes to laser cutting and machining processes. Our capabilities extend to a range of needs within the construction industry. For example, multi-axis laser cutting such as 5-axis laser cutting enables construction customers to produce many different kinds of parts at a fraction of the cost using traditional cutting processes and equipment. 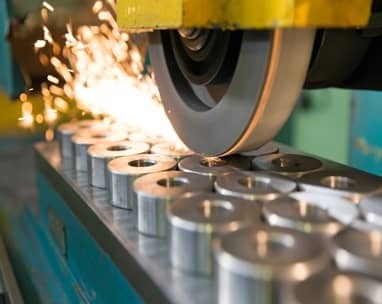 Thick plate cutting, A36 structural steel processing, high-strength steel, mild steel, stainless, and galvanized steel parts can all be customized much more efficiently with lasers, resulting in smoother finished surfaces and less downtime due to equipment maintenance. This makes laser cutting an ideal choice for a full range of construction industry needs. Laser Cutting Company meets the requirements set by the industry recognized ISO 9001 standard. Meeting and exceeding customer requirements in the construction industry is easier with the flexibility and capability provided by laser cutting. From large part processing and thick plate cutting to highly precise and small, intricate parts, laser cutting can be used in many applications to maximize efficiency. Laser cutting provides a cost-effective alternative to building expensive dies to customize parts. This is useful at all stages in the process, from product development through production, ensuring that necessary changes are easy and cost-effective to implement whenever necessary. Why Choose Laser Cutting Company for Your Construction Industry Needs? Laser Cutting Company handles projects of all size for the construction industry—from one-off products and samples to full production runs. Our administrative and operational processes let us respond to your needs quickly and efficiently, starting with providing quotes to customers within twenty-four hours and ensuring a fast and error-free production run. We handle your part edits quickly and efficiently in-house. We are agile and able to make engineering changes even on a production run, maximizing the customization that each project, client, and industry needs. Our service extends through every part of your process, from programming to fixturing to cutting, in full compliance with ISO 9001 standards.